What kind of security device can act as a deterrent against burglars while also allowing you to monitor your property when you are away? A home surveillance camera, of course! 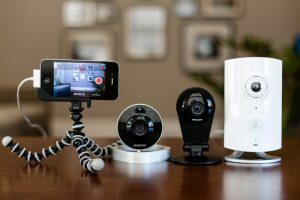 As is true for home security systems, there are many different kinds of home security cameras to choose from and each one offers a unique array of benefits. Although there are many options to choose from, it doesn’t have to be difficult to make the right choice. You just need some basic information about your options. To make your task of choosing a home security system easier, we’ve compiled some helpful information about the different types of home security camera and the various security features they offer. Here you will find a comprehensive guide to help you make the smart choice. Keep reading to learn more about choosing a home security camera! Having a visible network of home security cameras can act as a deterrent against property crimes like burglary and invasion. Installing a home security camera will allow you to monitor your property even when you are not at home – some cameras offer live stream video capability. If a burglary or some other property crime occurs, you will have visible evidence that may help the police identify and locate the burglar. Depending on the model you choose and how many you install, home security cameras can be expensive to purchase and maintain. Security cameras are not invulnerable to tampering – some models are easier to disable than others. Simply having security cameras in place may not be enough to deter criminals and they can’t do anything in the way of actually stopping theft. There are other benefits and drawbacks to home security cameras, of course. But to understand them you need to have a basic understanding of the types of security cameras out there and the security features available. Keep reading to learn more about home security cameras. Hidden Cameras – If you want to capture security video without your subject knowing, a hidden camera system is the way to go. If your goal for installing a camera system is to deter burglars, however, hidden cameras probably won’t help. Box Cameras – This is the most common type of security camera – they are a visible deterrent for burglars, and they are a cost-effective option for homeowners. Some box cameras can even be used with interchangeable lenses so you can adjust the field of view and viewing angle. Dome Cameras – Also a popular choice, dome cameras come in a variety of sizes, and they are typically less obtrusive than larger box cameras. Dome cameras are easy to mount, and some of the higher end models come with interchangeable lenses. Pan/Tilt/Zoom Camera – This type of security camera offers a variety of monitoring options because they can swivel up and down and move side to side, giving you a 360-degree field of view. These cameras are also frequently remote-controllable, so you may only need one, depending on the area you want to secure. Bullet Cameras – Similar to box cameras, bullet cameras come in a wide range of sizes from large to small and compact. These cameras offer flexible monitoring, and many models come with interchangeable lenses, including variable focal length zoom lenses. In addition to there being different kinds of home security cameras, there are also different ways you can view security footage. The most common method for video recording is a memory card – some cameras have built-in memory cards while others need to be hooked up to a digital video recorder (DVR) system. Some security cameras are known as IP cameras because they allow you to view live video over the internet remotely. Some IP cameras require a cable connection while others are wireless. Field of View – The width of the area a camera can record is called the field of view. The field of view a camera can offer will determine how many cameras you need to cover a particular area. Cameras with a small field of view are adequate for indoor use to cover a single room, but you’ll need a wider field of view for outdoor use. Motion Detection – If you choose a camera with motion detection capability, it may also be able to send you a notification when it detects motion within the field of view. Some cameras remain on all the time but only begin recording when they sense movement – this can save you money and video storage space. Resolution – The resolution is simply the clarity of the image a camera records. If you want to be able to identify faces in your recorded video, you’ll need a camera that offers high resolution recording capability. Sound – There are two ways a home security camera can use sound. One option is that it can receive sound via microphone to record sound as well as motion. The second option is that it can emit sound through a speaker. Some cameras offer both options. Night Vision – Criminal activity frequently takes place at night, so you should think about investing in a home security camera with night vision (infrared) capability. The strength of a camera’s night vision will determine the distance to which it can record video in low-light or no-light situations. WiFi – Cameras that are hooked up to your home’s WiFi can communicate wirelessly with your home security system (if you have one) and can be accessed or controlled with a mobile app. WiFi cameras are also less susceptible to tampering because there are no wires to cut. Movement – A static camera is one that remains in a fixed position. A camera that can pan and tilt can record a larger area than a static camera – this could reduce the number of cameras you need to cover a particular space. In addition to considering the various options in security features, there are some additional factors to consider when shopping for a home surveillance camera. For example, are you planning to use the camera indoors, outdoors, or both? While some security cameras are designed for indoor and outdoor use, most are not. Indoor cameras tend to be lighter and smaller while outdoor cameras are built to stand up to the elements as well as tampering by potential burglars. Outdoor cameras tend to be more expensive than indoor cameras due to their added durability – you can even buy outdoor cameras that are disguised as ordinary objects like a rock or an electrical box. Another factor you should think about when shopping for a home security camera is how well your property is lit. Commercial properties tend to be very well-lit, but many residential properties are not. If you want your security camera to work well, however, you need to invest in some quality lighting. If your property isn’t well lit, you may need to shell out for an infrared camera system. These cameras can get pretty expensive, but they can record video in complete darkness. There are also low-light camera models which are designed to work in low light but don’t have infrared capabilities. When shopping for a security camera, check the package for the “Lux” rating to determine the camera’s ability to capture video in low light. The third and potentially most important, factor you need to consider when purchasing a home security camera is whether or not it is part of a monitored home security system. It is entirely possible to buy a home security camera and to set up your network. If you want the added security of 24-hour monitoring, however, you may need to invest in a complete home security system. Monitored home security systems are more expensive than DIY options, but they offer some significant benefits. For example, you will have peace of mind knowing that someone is keeping an eye on your property when you are not at home. If a burglary or break-in occurs and the alarm is triggered, the monitoring company will contact you and can also communicate with the authorities on your behalf. Some home security systems come with security cameras, though for some systems they are an add-on feature. Every security camera is different, and the one that best suits your needs may not be the right choice for someone else. Be smart and think before you buy to determine what your needs are and which camera can meet those needs.